My children are quite a bit more grown up in their food tastes now, so I figured there probably wouldn’t be too many “yuck” faces when they saw eggplant, green/red/yellow peppers, and onion chunks swimming in their bowls. Much to my surprise, EVERYONE liked it, even my pickiest eater (although she did pick out some of the onions and peppers as I suspected she would). But the flavor was rated “Yummy!” by everyone. Over high heat, heat olive oil in a large pan or Dutch oven. Add onions and garlic and cook until softened but not brown. Stir in eggplant, zucchini, peppers, salt, basil and parsley. Add a little more oil if needed to keep the veggies from sticking. Cover and cook over medium heat for 30 minutes, stirring occasionally. 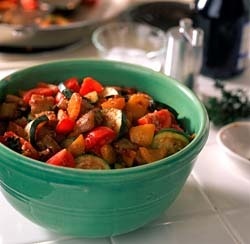 Stir gently and carefully to retain shape of veggies as they soften. Add tomatoes. Stir gently. Add more oil if sticking. Cover and cook over medium-low heat for an additional 15 minutes, stirring occasionally. This is best if served a day or more after preparation. It can be served hot, cold, or at room temperature.